Truly the most PERFECT Sugar Cookie Recipe ever! This is one recipe you’ll want to be sure to save, treasure and use again and again! 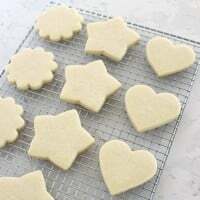 This recipe produces sugar cookies that are soft and flavorful, easy to cut out, and the baked cookies keep their shape! Hooray! This recipe was actually the second recipe I ever posted on my site… way back in 2010. But since then I’ve posted hundreds of other delicious recipes and it’s gotten a little buried. As we head into a busy holiday baking season I thought it was the perfect time to show off this tried and true favorite! This is the recipe I’ve used for most all of the pretty decorated cookies I’ve shared over the years and it’s truly the best sugar cookie recipe ever! In fact, I would love to know how many times in my life I’ve made this recipe… I’m guessing it’s well over 1,000! This Sugar Cookie Recipe is delicious as is, but is also a great base to play around with extra flavor! 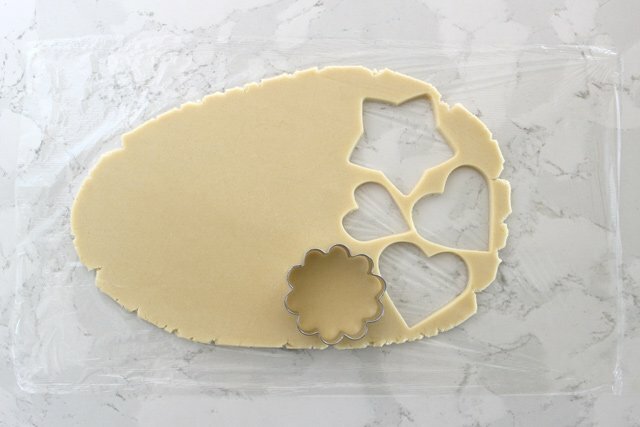 I’ll walk you through my process for making perfect cut-out cookies, and then there is a full printable recipe at the end of this post. 1. Prepare the dough as directed (in the recipe below). Lay out a large piece of plastic wrap onto a clean, smooth counter. If you have tile counters, you can do this on a large cutting board or marble slab. Grab about half of the finished dough from the bowl and knead by hand just a bit to create a nice smooth ball. Set the ball of dough on top of the plastic wrap, and press down to flatten a bit. *An alternative to rolling the dough out on plastic wrap would be to lightly flour your work surface, and roll out the dough directly on the floured counter. I’ve done this many times successfully, but the updated process I’m showing in this post is simpler, neater and the finished cookies are generally smoother (because little bits of flour and extra pockets of air are not added during the rolling process). My original Sugar Cookie Recipe post shows the more traditional method if you prefer. 2. 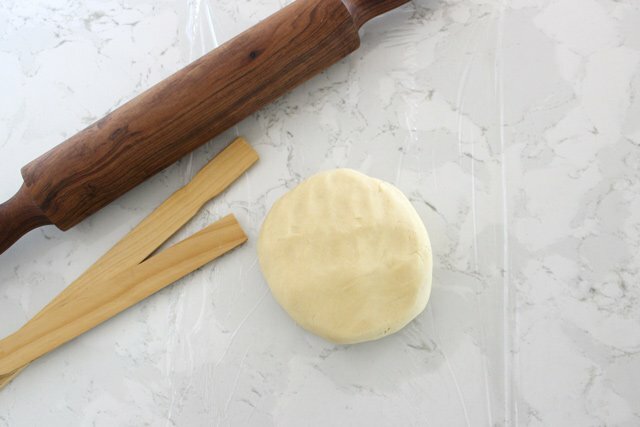 Lay a second piece of plastic wrap on top of the dough (straighten as much as possible). I use a homemade version of perfection strips to roll the dough into a perfectly even thickness. My sticks are simply two paint stir sticks (free from any hardware store) glued together, so I’m using a total of four stir sticks (one double-thick stick on each side of the dough). 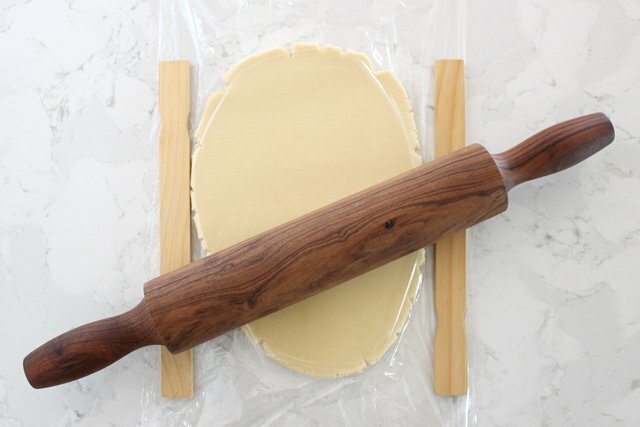 Place the sticks on either side of the dough (on top of both layers of plastic wrap) and begin to roll out the dough to the thickness allowed by the sticks. Move the sticks as needed, and vary the direction of your rolling as needed, until the dough is smooth, flat and one consistent thickness. 3. 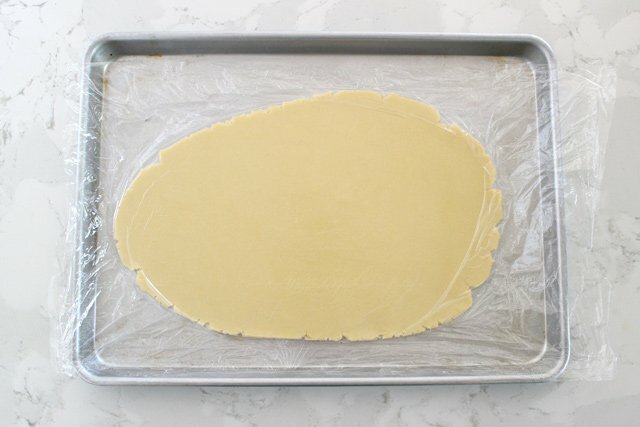 Pick up the slab of dough (enclosed between the two layers of plastic wrap) and move to a large baking sheet. Place the baking sheet in the freezer for 5 minutes (or fridge for 10-15 minutes). Chilling the dough makes it much easier to cut out. The chilled dough will not stick to the cookie cutters, and the cookies will keep their shape as you move them to the baking sheet. *Do not leave the dough in the freezer too long or it will be too firm to work with. Although if you do leave the dough in the freezer too long, simply place the slab of dough at room temperature a bit (maybe 15 minutes) until it’s softened just enough for a cookie cutter to cut the dough. 4. Cut out your desired shapes. Use the dough in an orderly way, working from one side to another, fitting in various shapes so you are creating as few “scraps” as possible. Once you’ve cutout as many shapes as you can on the slap of dough, roll the scraps into a ball, and roll out again just as you did before (starting back at step number one). You can re-use the same plastic wrap. 5. 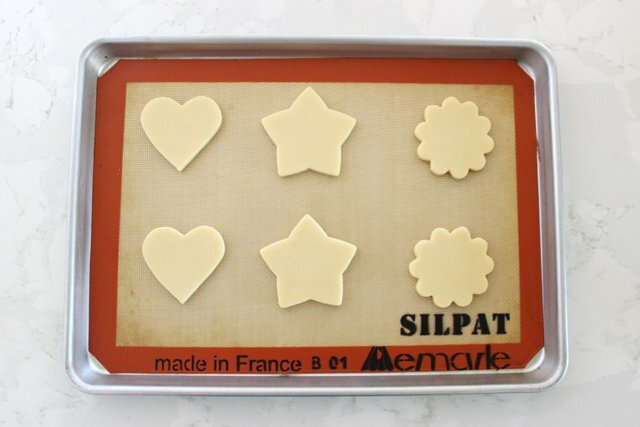 Place cutout cookies onto a baking sheet lined with parchment paper or a Silpat type liner. Place similar size cookies on a single baking sheet (do not bake large and small cookies on the same sheet). Allow cookies about 1″ of space between cookies. My preference at this point is to place then entire baking sheet of cut out cookies back in the freezer for about 5 minutes. This will ensure nice flat edges around your cookies, and they will hold their shape perfectly. Bake cookies in a pre-heated oven (do not place in oven until it’s reached the proper temperature). Bake on good quality baking sheets (heavy, with no non-stick coating) for the best results (the most even baking). 6. Allow cookies to cool for a minute or two on the baking sheet, then move to a wire cooling rack. My favorite spatula ever for moving the cookies without breaking them is this thin metal spatula. Allow cookies to cool fully before decorating. *If you do not plan to decorate on the day they were baked, move cookies to a large tupperware type container, layer with parchment paper between layers of cookies. Cookies can be stored in an airtight container at room temperature up to a week. *If you do not plan to decorate the cookies within a week, place entire container of cookies (sealed well, and with parchment paper between layers of cookies) in the freezer and freeze for up to a couple months. Allow frozen cookies to come to room temperature before decorating. Soft and flavorful, easy to cut out and keep their shape beautifully! 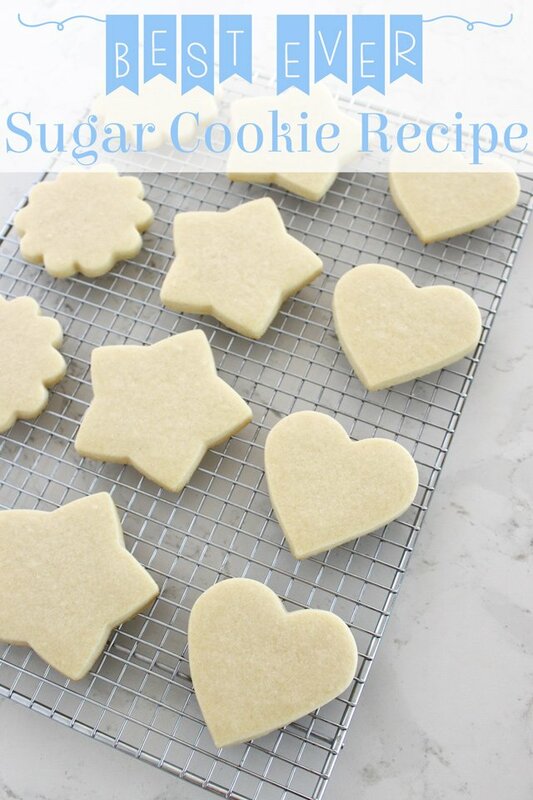 This is the only sugar cookie recipe you'll ever need! In a medium bowl, stir together the flour, baking powder and salt, and set aside. In the bowl of an electric mixer, using the paddle attachment, cream together the butter and sugar until light and fluffy. This should take 2-3 minutes. Blend until all of the flour is incorporated. The mixture will look crumbly at first but just keep blending until the dough begins to pull away from the sides of the bowl. Remove about half of the dough from the bowl and knead by hand just a bit to form a smooth ball. Roll out dough onto a lightly floured work surface, or onto a piece of plastic wrap (as described in detail in the blog post above). 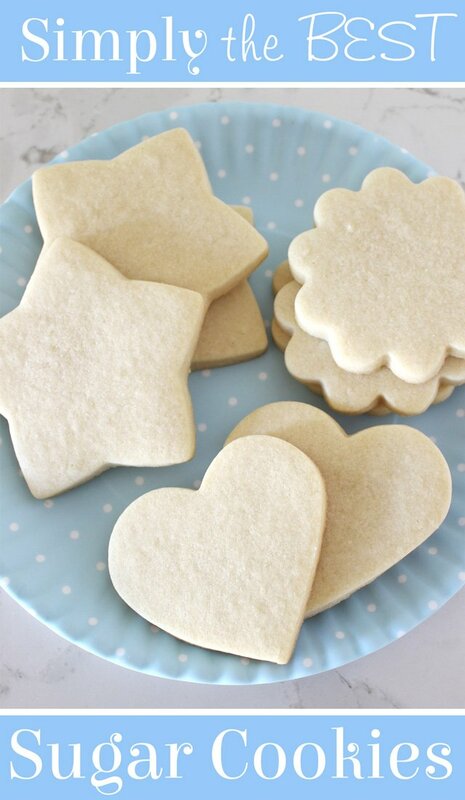 Cut out cookies into desired shapes and place entire baking sheet of unbaked cookies into the freezer for 5 minutes. Preheat oven to 350°F and bake cookies in preheated oven for 9-11 minutes, depending on the size and thickness of your cookies. The cookies are baked when then are no longer shinny on top, but they will not show much of any change in color. Cool on baking sheet just a minute or so, then carefully move to a wire cooling rack and allow to cool fully before decorating. I HIGHLY recommend using a large stand mixer to mix up the dough, if at all possible. It is possible to mix up the recipe with a hand-held mixer, but it will take a lot more hand kneading to combine all of the flour. Be sure to omit the additional salt if you are using salted butter in the recipe. Flavoring options - Feel free to add your choice of fresh citrus zest (1-2 teaspoons), or add 1/2 to 1 teaspoon almond extract in addition to the vanilla extract listed. If you prefer a more crisp cookie, simply bake an extra minute or two. Baked cookies will remain fresh at least one week (stored in a Tupperware type container, or individually wrapped). Baked cookies can be successfully frozen for a month or more. Layer baked cookies in a Tupperware type container with parchment paper between layers of cookies. Thaw cookies at room temperature before decorating. I do not recommend freezing the cookies after they've been decorated. 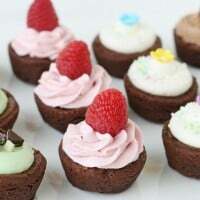 Recipe source - Glorious Treats (first posted March 2010). Similar recipes widely available. Once you have your perfect sugar cookie cut-outs, you can enjoy a couple warm out of the oven while you mix up an icing of your choice! You can make this SIMPLE BUTTER FROSTING if you’d like something quick, easy and delicious! Or if you’d like to do some more detailed decorating, mix up a batch of ROYAL ICING. I think that once you try this recipe, you’ll agree that it’s simply the PERFECT sugar cookie recipe! Disclosure – Shopping links to specific supplies provided for your convenience. I may receive a small commission from purchases made using these links, at no additional cost to you. Mine never come out looking as perfect as these . . . I will definitely be giving this a try! Bookmarked! Thanks, Glory! ! ! I have made your recipe a couple of times now and they are probably the only cut-out cookies that have ever turned out great for me. Thanks for re-posting with updated photos. I will try next time with plastic wrap!!! I saved your recipe some time ago and I make these fabulous cookies ever since. They always turn out spectacular. I love everything you post here. Thank you! Thanks- Im going to make these! I found the dough to be very crumbly and difficult to work with. I am still in the process but so far I have only had some luck with round shapes. The snowflakes just keep breaking. They do taste really good though. Hi Ellen, So sorry you’re having trouble. I’ve made the recipe hundreds of times… but that might be a disadvantage here because I’m super familiar with it. Sometimes it’s hard to help without being with you in the kitchen. At what stage is the dough falling apart, while it’s still raw dough, or the baked cookies? Did you use a large stand mixer to mix the dough? It is much more difficult to form a smooth dough without a large stand mixer, but it is possible… it just requires a bit more kneading. Are you rolling the dough between plastic wrap? If the cookies are breaking AFTER their baked, then they might just need to cool a bit longer on the baking sheet before you move them. Let me know a few more details and I’ll see if I can think of any other suggestions. I have also had the same problem with them being very crumbly. Wonder what we are doing wrong? At what stage are they crumbly? The dough itself, or the baked cookie? Neither stage should be crumbly. If it’s the dough itself, then are you using a large stand mixer? You’ll have best results with that. The dough can be made with a smaller mixer, and then kneaded by hand toward the end, but that will be quite a bit more difficult. Describe the issue you’re having a bit more and I will try to give you some ideas. I have had this issue as well. Once I have added the flour to the butter/sugar mix, it comes together but it remains as a crumb texture and will not bind together. It still feels a little gritty with sugar, even though I allowed it to beat until it was creamy/fluffy once the eggs and vanilla were added in. I have mixed it up in my large stand mixer, and left it to keep mixing as per your suggestion in the recipe; to no avail. I then tried to knead it a little by hand but it remains crumbly. I’m not sure if it is due to the fact that I am in Australia and if our “1 cup” measurements are different for the sugar. I have tried many sugar cookie recipes and have to say this is my absolute favorite! I followed your instructions carefully and it worked up just beautifully!! We will decorate them tomorrow, but they do taste great – as a sugar cookie should, wanting some lovely icing to add a little sweetness. Thank you for your detailed instructions and wonderful recipe! Made these today with my 6 year old granddaughter for Christmas. Followed directions exactly and they were perfect. NO spreading, no breakage, puffed up beautifully. Printed and saved recipe, this will be my go to now :). Butter frosting was also fabulous. I made these and they turned out well, but I realized as I was falling asleep that I forgot the salt. Looking back I realized it’s on the ingredient list but omitted from the instructions. Just FYI! Where did you get this beautiful wooden rolling pin?? I love!! I noticed your recipe calls for Challenge Butter. I am not familiar with that brand. Do you think it really makes a difference in taste? I do believe that it is important to use good quality butter, especially in recipes (like this) that have a large amount of butter, and rely on it for flavor. Often price is an indicator of quality… so I’d definitely steer clear of the cheapest store brands… but otherwise feel free to chose a high quality brand of your choice. Any chance you have the weight measurements for the ingrexients..especially the flour? if not, would you explain how you measure out the 3 cups of flour ibto the measuribg cup. thanks. This was wonderful! Thank you so much! Thanks so much! So glad you enjoyed the recipe! Hi just checking -what size are the sticks of butter in grams. We don’t have that brand in Australia and want to make sure I have the same weight. 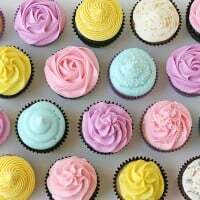 Do you have a recipe for the icing you used? I cannot find a good icing that will fill in the way that yours does. If you have one, I would truly appreciate if you would send it to me. Hi, could you give me the recipe in UK grams please. According to google, 1/2 cup of butter (which in the U.S. is one stick) is 113 grams. Hope this helps. Happy baking! Can this recipe be done with a hand mixer? Yes, it can, but it’s much easier with a large stand mixer. If you do not have a stand mixer, you will have to kneed in the last cup or so of flour by hand, because the dough will be likely too thick for a hand mixer. So it’s a bit more work, but still doable. Happy baking! I have made this recipe and omg so good with your frosting. So soft and amazing. Let the kids help decorate and they had a blast. Thanks wish i could post pics. Hello! I was wondering if I could decorate these cookies using your royal icing recipe and then freeze them. And if so, how long they would last. I am wanting to do cookies like these for my brothers graduation in May, but it would be really convenient if I could get them done in advance! Thanks! 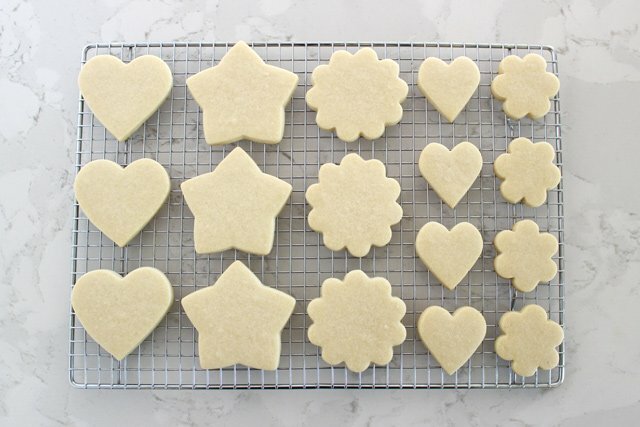 This recipe made me so happy – I’ve been pinteresting and YouTubing and fantasizing about decorating my own beautiful sugar cookies for years, but having the right cookie has always held me back. Yours tastes amazing (I do it with almond extract cause I love that flavor cookie) and is the ULTIMATE canvas for icing!!! Thank you for sharing! And it’s not hard to make, and your technique for mess-free, even, foolproof rolling is a game changer for me. I have a question – How thick would you say your two paint sticks are? I’m basically asking how thick you roll your cookies out to. I lost track of the paint sticks I picked up and substituted Mah Jong rulers (if you know what I’m talking about, they are shocking perfect for the job – maybe even better than paint sticks), and I find I’m torn between double stacked stick thickness and single stick thickness – I did almost all of them double stacked per your directions (I found one single used paint stir stick after the fact and found it was almost the exact thickness of the Mah Jong ruler), which would have been fine, except – in comparison with the last batch I tried with the single stick thickness – they rose and expanded more, which made them less flat and sharp-edged than the single-thickness ones (and what yours look like in your pics!). I only tried cutting pretty small cookies out of the thinner ones (like 2″ squares, so not very big and no odd arms that might break off), so I wonder if they might be subject to breakage, but I like how nice they looked and (I know it’s hard to tell) they look more like yours online! So it made me wonder how thick yours were, and if you have an opinion or experiences as to trying thinner ones. Also, do you have an opinion on freezing cut cookies? How long have you tried freezing them in advance? How long do you feel the cookies save for after baking and icing? I’m a mom, I want to do these for birthdays (one coming up next week as a matter of fact! ), and I’m figuring out ways to do things ahead of time so we can have the amazing cookies without the hard push and stress right before birthday time. style icing, not got off to a great start as I have converted into grams ( for the UK) and unfortunately only used 1 cup of flour. I’ve corrected and there currently chilling. Hoping they will turn out ok. The last cookie I made was definitely a cake. Can’t wait to try this recipe, thanks. It says you would mention which brand of vanilla extract you prefer but I can not seem to see it listed. Are you able to enlighten me? My note in the ingredient listing refers to a note at the very bottom of the recipe card that mentions additional flavorings to experiment with (citrus zest, almond extract, etc). Feel free to use your choice of vanilla extract but be sure it’s listed as “pure” vanilla extract, not imitation. Looks so good, definitely will try these, hopefully Will find the time tomorrow! I have one question though, if i read correctly, you freeze the cut out cookies for 5 min before they go in the oven? Yes, I freeze the entire tray of cutout cookies for about 5 minutes (or the fridge for 10 minutes if you don’t have room in your freezer) before baking. This helps the cookies keep their shape while baking. Happy baking! I’ve made these several times and they always come out great. However, sometimes the consistency of the dough varies. Do you scoop your flour into the measuring cup, or do you spoon it in. This can make such a difference in the amount of flour you end up with. I wonder if you would consider weighing your flour when you make them next, and posting the weight in the recipe along with the volume. Ounce or grams – either one would help. Thanks for a great recipe! Would like the icing recipe please. 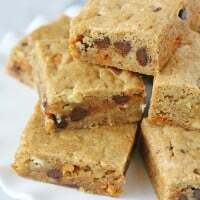 Hi Gloria, I have tried this recipe and let’s just say they are usually gone in less than a day they taste that great. The problem I am having is that my cookies deflate while baking and become more like flat pancakes than actual biscuits and do not hold their shape. What do you think I’m doing wrong. 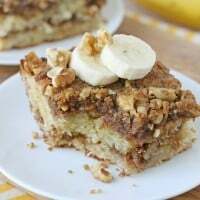 Love the recipe and want to make them for my nieces baby shower.